In footballing circles, it’s a well worn cliché that the league table doesn’t lie. 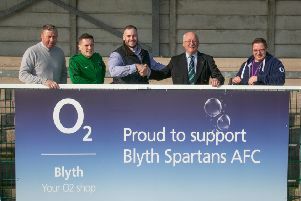 Try telling that to Billingham Synthonia, the basement club in the first division of the Ebac Northern League who with one win and four draws all season, prop up the division and face a difficult task if they are to maintain top flight status in the ENL. Yet at Woodhorn Lane on Tuesday night - and after going a goal behind - they frittered away a plethora of glorious chances in the second half before Dale Pearson’s stoppage time effort put the seal on an Ashington victory. The crowd were clearly frustrated after watching a dreadful first period. For Synners, Jordan Jewson was through on the quarter hour but fired wide then with half time approaching, a 30 yarder by David Hillerby was expertly tipped around by home ‘keeper Conor Grant diving low to his left. Ashington’s only notable threat came midway through when a dangerous looking cross from the left by Pearson was cleared. Goals change games. A mere 27 seconds into the second half, and the deadlock was broken. Callum Johnston burst down the left flank and when he cut the ball back for Tom White his effort was blocked by ‘keeper James Dawson. The ball rebounded off full back Tom Gavin and crept inside the corner. Surely this would provide the spur for a better showing from the home side but apart from a header by Wayne Buchanan which drifted over, and a restart by David Edwards which Dawson pushed aside, it was the Teesiders who came to the fore, as they carved out a procession of opportunities. Only four minutes after being introduced as a substitute, Foster Garton connected with a low free-kick at the near post but blazed over. And on the hour, the Colliers were indebted to Grant from preserving their lead. A three man move by the visitors from the half way line saw the ball fall to the unmarked Jewson who looked a certain scorer until his right footer was superbly tipped over by the stopper and from the resultant corner, Hillerby stabbed wide. Centre back James Rowe sent a diving header past the upright then Craig Hindmarch was off target. Supporters who left early, missed the one genuine piece of quality on the night - in the first minute of stoppage time. Ashington player/manager – introduced as a sub for David Edwards – won the ball in the midfield and laid it off for Tom White. The newcomer – on loan from Gateshead - produced a great run down the right touchline, evading two tackles. Referee Michael Burrows played a superb advantage and when White whipped the ball low across the face of the goal, the inrushing Pearson blasted into the net. *On Saturday, Ashington are at home to West Auckland (3pm). Ashington: Grant, McAndrew, Hornsby, Henderson, Christensen, Buchanan, Stevens (Williamson 68 minutes), White, Pearson, Edwards (Bowey 76 minutes), Johnston. Subs not used: Carr, Lancaster, Glasper (gk).